Fears of the federal sequester did little to deter private-sector employers from dramatically boosting job creation last month, providing further evidence that the job market is building momentum. This trend has been reiterated by a drop in first-time unemployment claims, with the four-week moving average tightening to a new post-recession low. Although the sequester could offer some near-term certainty to businesses, worker furloughs, canceled government contracts and reduced funding for numerous programs could slow private-sector hiring. It remains unclear whether Washington will reduce the cuts or provide agencies wider latitude on how they implement them, both of which would be seen as a positive sign by businesses. Business conditions made headway last month, supporting a wide range of private-sector industries including energy, housing, retail and auto manufacturing. As a result, all 10 private-employment sectors added workers in February, easily offsetting a loss of 10,000 government jobs to yield a net gain of 236,000 positions. Professional and business services staffing grew by 73,000 workers in February, the most jobs added in any private-employment sector. In addition, temporary staffing’s share of the hiring continued to wane, underscoring companies’ willingness to commit to full-time positions. The momentum is further supported by the housing sector recovery which sparked the addition of 48,000 construction jobs last month. 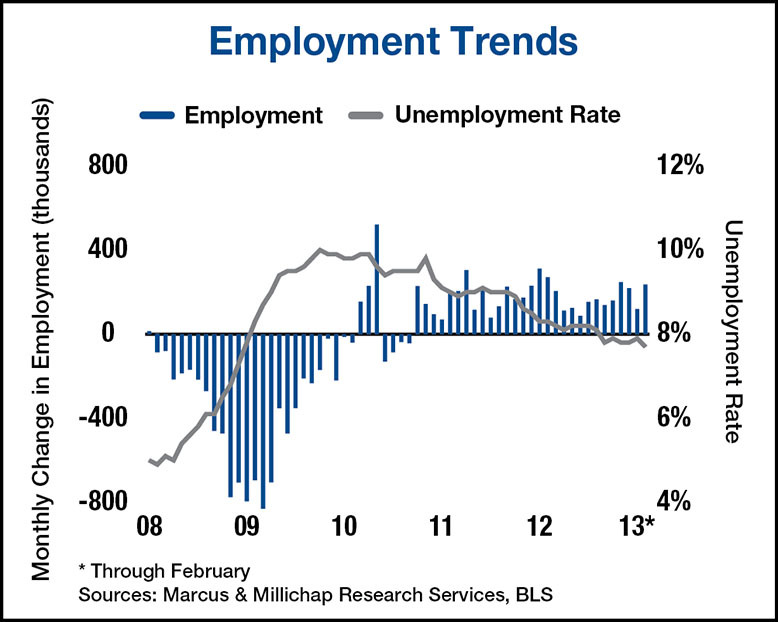 The unemployment rate dipped 20 basis points last month to 7.7 percent, the lowest level in four years. Although a reduction in the labor force was the primary driver of the reduction, a decline in the headline catching number will boost enthusiasm. Monthly decreases in the labor force are not uncommon as workers move in and out of the job market, and the fall last month obscures the longer-term rise in the work force since 2009. Further private-sector job growth will likely boost the labor force in coming months, but the unemployment rate will likely trend lower over the course of the year. Fueled by the gain in professional and business services payrolls in February, full-time office-using employment expanded for the 18th consecutive month. Increases in financial services and information employment generated an additional 84,000 full-time office positions, the largest gain during that stretch. Ongoing staff additions may lead many employers to begin their move into larger layouts in the months ahead, supporting a 90-basis point drop in vacancy this year. Recent job growth and a desire among many households to retain mobility to pursue employment opportunities will support strong operations in the apartment sector throughout 2013. Nationwide vacancy was 5.1 percent at the end of last year and, despite an expected increase in completions, vacancy will dip to 5.0 percent in 2013. There remains a chance, however, for private-sector hiring to build momentum, thereby unlocking pent-up rental housing demand. Should this trend emerge, vacancies could tumble even further. This entry was written by marcusmillichap, posted on March 15, 2013 at 10:19 pm, filed under Research and tagged Commercial Real Estate, Employment. Bookmark the permalink. Follow any comments here with the RSS feed for this post. Post a comment or leave a trackback: Trackback URL. Hi to every , because I am truly eager of reading this webpage’s post to be updated daily. It carries fastidious information.